What is DWG? How To Open DWG Files? DWG (drawing) is an AutoCAD (Computer Aided Design) file format used for storing two and three dimensional design data and metadata. It is one of the most commonly used design data formats, which is also supported by IntelliCAD and all its variants, PowerCAD, and several other software applications. DWG was originally developed in the late 1970s by Mike Riddle and licensed in 1982 by Autodesk. Since then the format has been updated several times, the latest version being of 2013. The important thing to remember here is that even though the newer versions can read DWG files created in older versions, the older versions cannot read newer ones. Today DWG is the de facto format for all CAD interoperability as well as being the base format of all its applications. Since DWG is a proprietary file format, in 1998, several software developers and vendors came together and formed an association called OpenDWG Alliance. The intention was to make DWG an open standard but it hasn’t succeeded so far. At the same time, Autodesk have not been able to obtain a trademark for DWG. In 2011 the USPTO issued a final refusal to register DWG as a trademark owned by Autodesk' later in 2013 it affirmed this desicion. The struggle between Autodesk and OpenDWG Alliance proves the popularity and usefulness of DWG as an image file format. DWG files, with the file extension of ‘.dwg’, can be opened on Windows by Autodesk AutoCAD, SolidWorks eDrawings Viewer, IMSI TurboCAD. DWG files can also be opened on Mac OS using Microspot DWG Viewer, PowerDWG Translator, IMSI TurboCAD, and SolidWorks eDrawings Viewer. If you don't have those expensive CAD programs you can still view DWG files after you convert them to PDF, TIFF or JEPG. 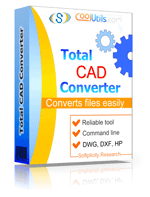 Use Total CAD Converter for that.